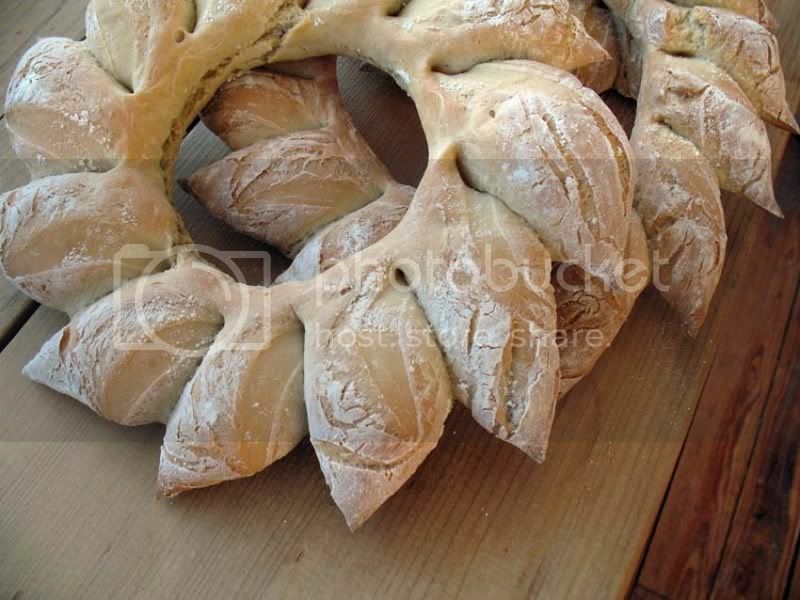 When I was uploading images to tastespotter.com yesterday, I came across pictures of a Holiday Wreath Bread and thought that it'd be a lovely addition to the list of finger foods I'm preparing for a party I'm having on Friday. As I don't have the 'magic' no-kneed bread dough always ready in my fridge, I used the recipe for bread dough from my Olive and Parmesan Bread. 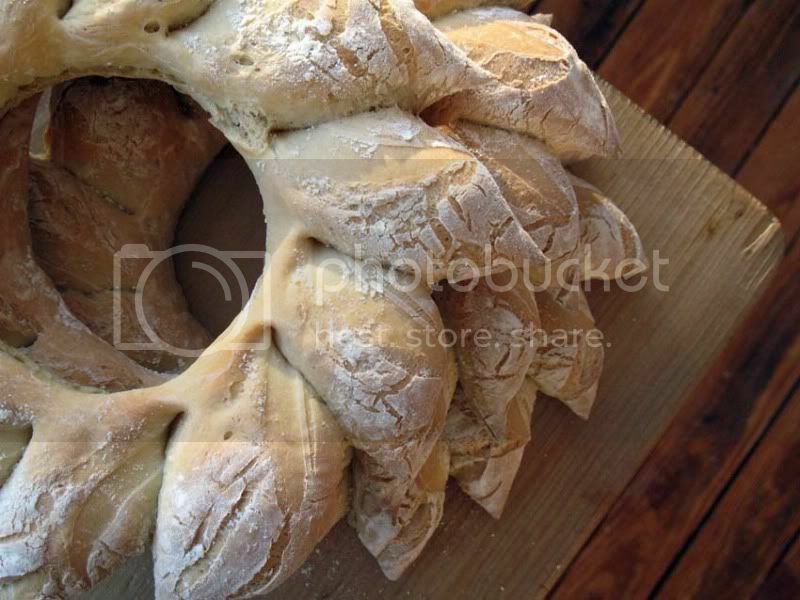 Once it had risen for the first time, I divided it into three equal parts and followed the instructions given on the Artisan Bread in Five Minutes a Day blog, to make three bread wreaths. It was really easy, as promised, and looks wonderful. I just wished I could break a piece off right now and eat it, rather than putting it in the freezer for Friday. That bread will be a beautiful part of your meal on Friday. It looks so festive as well without being overdone. I love the idea. Wow that look so beautiful. The "Artisan" method really is good; I haven't bought any bread since I discovered it early this year, and I'm now confident enough to play around with different flours. It's much better than that other no-knead method that involves 17 hours' rising ,and cooking it in a pot. Absolutely beautiful. I may have to make this for a Christmas party in a couple of weeks. Sylvie, much like last year you're sharing your Xmas traditions from Germany and I'm delighted...the wreaths are beautiful. Your wreaths look gorgeous! I'm so thrilled you tried it. Bravo!!! So pretty, and practical too. We almost always tear our bread loaves anyway. What nice crusty portions this would make. Thanks for sharing! Oh my goodness, this is gorgeous! I am definitely trying this! They are beautiful. I've loved making the Pain d'Epi so this will be on my holiday list to try. Thank you! Your bread looks so beautiful Sylvie! I could never do anything as nice as that! Wow, they look fantastic. Beautiful! Goodness, those look fantastic! I might have to put aside the cookies and bake a wreath or two of my own. Really, really lovely! Such beautiful bread - just gorgeous! Clever stuff Sylvie - not sure I would have the patience I have to say! That bread looks beautiful. Hope you have a superb party. Look forward to reading about it? Thank you for that - it looks wonderful. Definitely one to try. Sylvie, your breads are absolutely stunning. Bravo! This must be the best bread I have ever seen. Absolutely beautiful. I've never seen any made this way. They look wonderful.